Piece of Cake is almost as sweet as the treats on her cute dress! 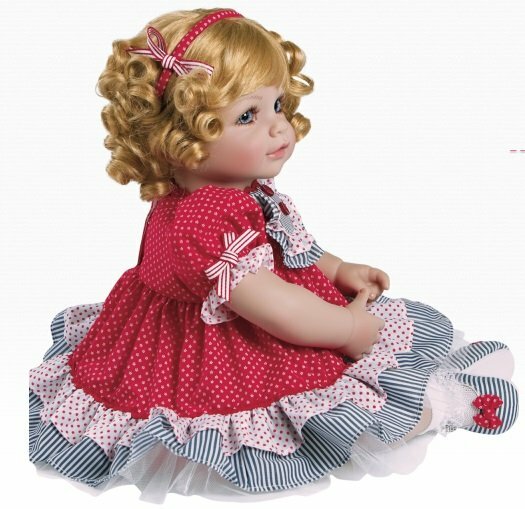 She has brunette curly hair styled in pig tails and trimmed in bows that match her dress. Her dress is pastel blue and white stripes with puffy sleeves and a peter pan collar under a very full and ruffled pinafore. She also has white lacy socks and pink shoes to complete her outfit. Piece of cake is about 20 inches tall and has a vinyl head and 3/4 length limbs on a soft cloth body that is weighted and jointed.